I do not believe in “chance meetings”. I believe that things in life happen for a reason, although many times that reason is not realized until much later or perhaps, never. Sometimes there are just too many perfect circumstances involve to meet again “by chance”. I do not know “why” the Lockwood family is back in my life, but I am truly thankful that they are. I was flying into Athens from Vienna, they from Hawaii. Sandy and Wanda’s London flight was delayed 3 hours, so I took the Underground metro to my hotel, instead of waiting for them to get in. There are probably around 15 metro cars for each train and they leave about every 30 minutes from the airport, so to have the Lockwoods end up in the same metro car as me at the same time was an amazing phenomenon. I was sitting calmly trying to not look touristy (while reading my Let’s Go guide to Greece) when I heard a vaguely familiar voice. I looked up and thought hmmmm….that woman looks just like June Lockwood. I then heard the unmistakable voice of her husband Frank. I felt a surreal calmness as I said “Frank? June?” I received a blank look from Frank but I could see the wheels churning in June’s mind. To give them credit, I was not the young blond girl they new from Hawaii. I was 11 years older, had redish hair and glasses. Once I said my name, the recognition came to their eyes, although followed with the same look of disbelief. Frank and June were accompanied by their daughter Sarah (a beautiful 15 year old…a far cry from the toddler I remember) and Frank’s uncle Steve, a full blooded Greek who’s knowledge of the language came in handy when deciphering menu’s. 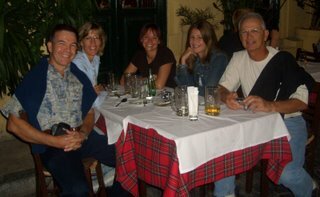 I was able to spend dinner the first night in Athens with them and although there are over 200 Greek Islands, “by chance” we were going to the same one (Santorini) at the same time later in the week. We met up again for one more wonderful Greek dinner together and now with the advancement of technology (email was foreign to me in 1995) we will be able to keep in touch easily. I am blessed…and sometimes wonder (to quote the Pet Shop Boys) “what have I, what have I, what have I done to deserve this”?